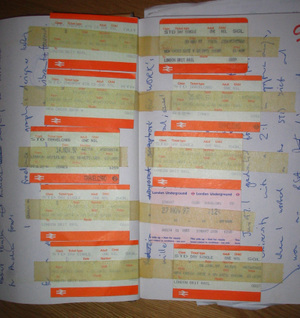 Things I've learnt about design. I think I'm going to make this a separate category. A book. 10 years ago. More finds from my old scrapbook (stop me if all this reminiscing is getting a little boring). About 10 years ago I had this idea for a book. It was a crap idea and it never went anywhere. 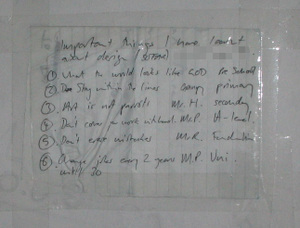 But I did compile a list of people I would like to contribute. 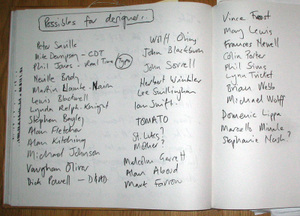 So this is kind of a list of the Top 30 or so graphic designers from ten years ago. As decided by me. Most of these people would be on that list if I wrote it again today (there would be additions obviously). Quite a few of them I've met now, which is a bit odd. 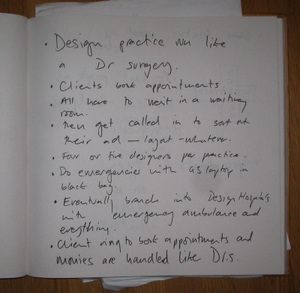 I had this idea that you could run a design consultancy like a doctors surgery, or a hospital. Not really sure what this was about. Looks interesting though. Once upon a long, long time ago I applied for a job on a pornographic magazine. As a designer. I even went for an interview. In the interview I had to design two double page spreads in one hour. I remember finding that really hard at the time, whereas now it would be easy. 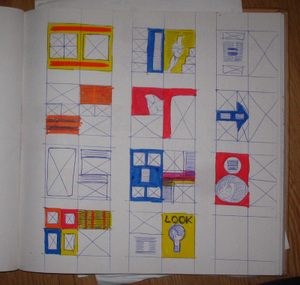 The day before the interview I sat down and tried to work some through some layouts on paper. Looking back they seem devoid of any real thought. Completely gridless! But colourful and all good fun. I didn't get the job and I was told that my layouts weren't, er, graphic enough (not the graphic you and I mean). Shame - because they paid very well! I loved this logo then, and I love it now. 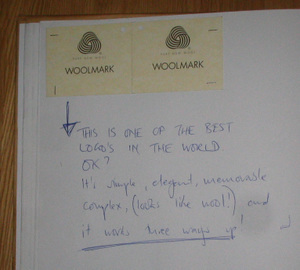 Could your portfolio be written in biro? We were going through some stuff in the garage yesterday and I found a scrapbook that I started keeping straight after I'd left University. Some of it is absolute rubbish, some of it is naive, but some of it I still like and agree with. Seeing as it's a Bank Holiday (in England anyway) I thought I'd post some of the pages here. 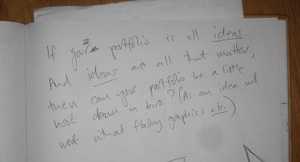 Here's the first one, where I talk about creating a portfolio in biro.